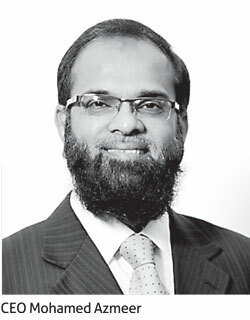 Amãna Bank, Sri Lanka’s one and only licensed commercial bank operating in full conformity to the non-interest-based Islamic banking model, has recorded its first profitable quarter for Q4 2014. According to the financials released to the Colombo Stock Exchange, the bank, which commenced achieving monthly operating profits in August 2014, recorded Rs.88.5 million as profit before tax for the fourth quarter of 2014. As a result, the bank has minimised its loss before tax for the year to Rs.80.3 million from Rs.438 million in 2013. The bank continued to showcase a strong momentum in its top line performance while total assets of the bank witnessed an impressive growth of 49 percent to stand at Rs.34.9 billion for the year ending December 31, 2014. The net financing income recorded a significant growth of 68 percent to reach Rs.1,209.6 million. The bank achieved a total operating income of Rs.1,668.7 million indicating a growth of 57 percent. The bank’s growing popularity and acceptance resulted in a 62 percent growth in customer deposits during the year to reach Rs.29.2 billion and a 69 percent growth in customer advances to reach Rs.25.4 Billion. Commenting on the bank’s achievement, Chief Executive Officer Mohamed Azmeer said, “I am extremely pleased on the bank’s progress achieved during 2014, in the context of the challenging environment in which we operate. Our results reflect the continued confidence and trust placed in us by over 150,000 customers for which I am grateful. Amãna Bank is listed on the Diri Savi Board of the Colombo Stock Exchange. The bank was recently recognized as the World’s Best ‘Up-and-Comer’ Islamic Bank by ‘Global Finance Magazine’ at the 18th Annual World’s Best Banks’ Award Ceremony 2014 held in Washington DC, USA, which coincided with the annual IMF and World Bank Conference. Powered by the stability and the support of its strategic shareholders including, Bank Islam Malaysia Berhad, AB Bank in Bangladesh and Islamic Development Bank based in Saudi Arabia, Amãna Bank is making strong inroads within the Sri Lankan banking industry and is focused on capitalizing the growing market potential for its unique banking model across the country.